This weeks theme: Dungeons & Dragons! Love DND? Join us. Never played DND? Join us. 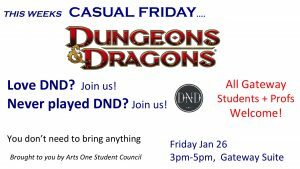 All Gateway students + profs are invited to drop by for some DND fun. Channel your inner Wolowitz and play in-character, or just sit back and enjoy.